Maria das Dores was a few hours from being buried alive when an official noticed she was still breathing. The 88-year-old was rushed back to the same hospital who had earlier declared her dead. "The first clue to the method and mystery of the book is found in its title, Finnegans Wake. Tim Finnegan of the old vaudeville song is an Irish hod carrier who gets drunk, falls off a ladder, and is apparently killed. His friends hold a vigil over his coffin; during the festivities someone splashes him with whiskey, at which Finnegan comes to life again and joins in the general dance." On Tuesday I drove up to Venice to take part in the monthly "Venice Wake" book club meeting. I'd gone up there for one of the meetings earlier in the year and had a great time but it's a terribly long drive and I always have to work the next day so I never went again. Since I'm moving to Austin at the end of the month I figured this might be my last chance for a long time to be part of a Finnegans Wake reading so I made the trek. The reading club actually focuses on both Marshall McLuhan and Joyce, with the first half hour devoted to discussion of current events through the McLuhan tetrad, followed by a reading of two pages of the Wake by all the people in attendance. After that, the participants go through the text that was just read and try to uncover meanings, references, coincidences, jokes, songs, etc. It's all in there. This is my favorite part of the meetings as in just two pages of the Wake, there's enough material to form an encyclopedia (and, no, I'm not exaggerating). "in condomnation of his totomptation and for the duration till his repepulation"
"Auspicably suspectable but in expectancy of respectableness"
"(thunderburst, ravishment, dissolution, providentiality)" - a clear statement of Vico's cycle, one of the main themes of the book. Surprisingly, nobody pointed this out. "Guilty but fellows culpows!" - first time I spoke up during the meeting. This is a play on "felix culpa," the "happy fall" of Adam and Eve (happy because it led to the eventual redemption in Christ) as celebrated by St. Augustine. Again, surprisingly nobody realized this since it's a recurring phrase in the book. Usually as "Phoenix Culprit" for the incident that occurs in Dublin's Phoenix Park. from there, the rest of that paragraph (pg 363) contains elements of an Eden scene, as we read "sindeade," "atome's health," "the wonderlost for world hips," and "unlifting upfallen girls." Afterward, I hung out at a coffee shop with a few folks from the club and had great conversation. Two of the guys I chatted with were personal friends of the legendary Timothy Leary and told a bunch of stories about him and I gave them the gist of my upcoming paper on Joyce and Dali which they seemed to love. Hopefully I'll see those guys again sometime. 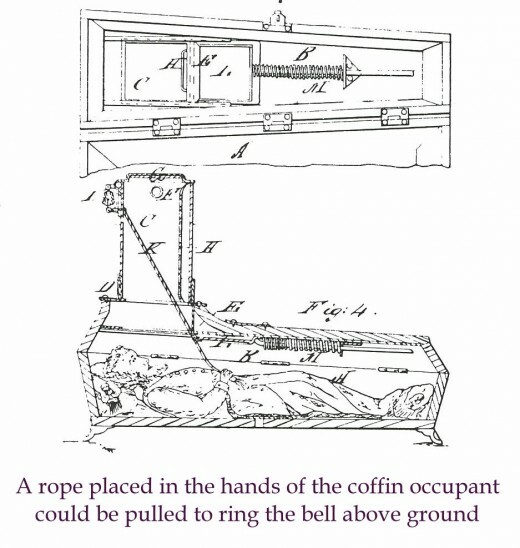 A safety coffin or security coffin is a coffin fitted with a mechanism to prevent premature burial or allow the occupant to signal that he has been buried alive. That's so great that you made a visit, PQ. I wish you could come up and join us for a session before you head to Texas, but maybe someday. Very happy to know about this group. I lived in Venice as a small child myself, but I see that they actually meet in Marina del Rey, another part of the L.A. area I know pretty well. Well, let's hope there is a lively Joyce scene in Austin. Or maybe it will be up to you to start one. I liked your contributions to the discussion. What drives me (pun intended, though I borrow this pun from Michael, one of the dudes I spoke to at the coffee shop) to go all the way up there, 2-3 hours, for that book club is that I've become convinced, through enjoying its seemingly infinite depths of meaning, that Finnegans Wake is one of the greatest artistic achievements of all time. At the moment I find it so richly rewarding to read about to the point where I'm trying to discipline myself NOT to get too sucked into it so that I can devote myself to a few other projects first. I feel like I could easily spend the entirety of my free time studying about and reading that book, if only I could brush everything else out of the way first. The reason I bring that up is because I would definitely love to participate in one of the sessions up there in Santa Cruz with you folks, certainly the next time I'm in San Francisco (a place which seems to be my ultimate goal destination in this country). I had no familiarity with Venice or that area before going to two of the meetings, it's amazing up there. The library where they meet (the Marina Del Ray Library on Admiralty Way) sits right on a dock with sailboats and the water right there outside the meeting room window. Great atmosphere and a lot of cool, highly intelligent and funny people in the meetings. The first time I went there were at least 30 people and they were from all over the globe, many different ages. Reading aloud and discussing Joyce's insanely brilliant dreamspeech book. One of the coolest experiences in my life probably. This last time was great too except a smaller showing and I was very late (the LA traffic is always a debilitating torture experience). The coffee shop they met in afterward, Abbott's Habit, felt like it was in a different world. The whole block was like the old streets in Italy. I had always talked of eventually starting a Joyce group in San Diego (they don't have one right now) at some point. If I'm still in Austin once I finish writing my Ulysses project, I'll definitely consider creating one. No Joyce groups there right now but I know the University of Texas in Austin used to publish a yearly collection of new Joyce studies (http://www.utexas.edu/utpress/journals/jjsa.html). Maybe I can connect with some of those people. When I was just out of high school, I stayed with my aunt and uncle in Westchester. My uncle and I used to go and walk around the marina and he would ask me which boat I would like him to buy for me. It was a game, but an affectionate one. Like you, I feel as though it would be possible to get entirely swept up in Joyce, and like you I have other projects I need to attend to so have to kind of keep a little distance from that possibility. I hope we do see you up this way at some point, and though we are a much smaller group than the Venice one, the plus side is that there is a lot of time for people to talk about whatever strikes them. I can't quite imagine having the energy to talk about Marshall McLuhan too, but it sounds like a fun group all the same.